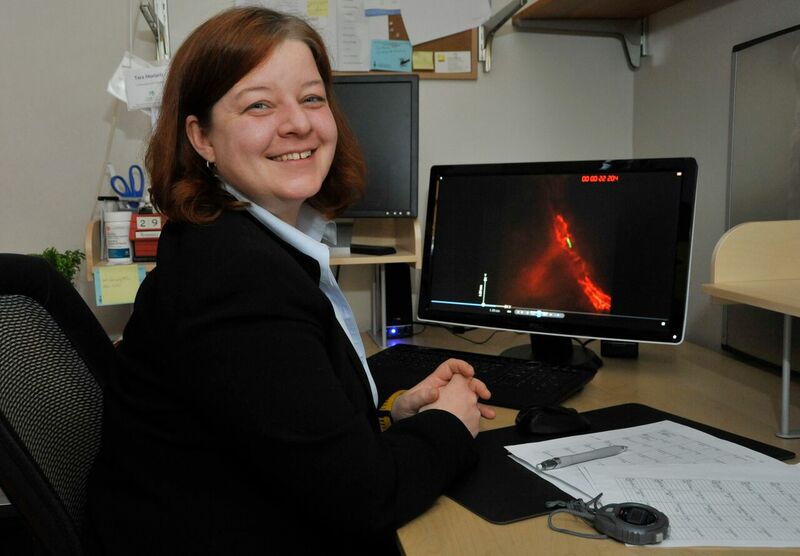 The following Q&A is a continuation of an interview with Tara Moriarty, proprietor of the Moriarty Lab, an infectious diseases research lab that studies primarily Borrelia burgdorferi (Bb) the bacterium that causes Lyme disease. Moriarty is the principal investigator of a new academic paper from the University of Toronto that details the mechanism by which Bb "crawl" through the body -- a scholarly article that turned out to be unexpectedly popular. How do you think your findings about the biomechanics of Lyme disease bacteria may affect treatment of the disease? Your research shows that Bb uses specialized adhesive bonds to "crawl" along the insides of blood vessels. Tara Moriarty: Absolutely, targeting this adhesion mechanism could be very important for preventing Bb from moving this way, forcing it to stay in the bloodstream and preventing it from escaping into tissues outside the bloodstream. From a treatment point of view, this is by far the most important potential implication of this study. I can't emphasize enough, though, that all of this takes years of work, and that this work is primarily carried out by graduate students, who have to learn the required techniques to do the work (a pretty long process for the work we do), and then repeat and repeat their experiments until they work properly, then do endless new experiments which we realize are needed after we see the results of each preceding experiment, and all this while the students are attending classes and writing papers and reports for their classes and their graduate committees and conferences. We go as fast as we can, but the work can be arduous and long, and we're wrong about our hypotheses more often than we're right, so getting from the stage of knowing how the mechanism works to even having a chance of identifying a possible inhibitor is a long and risky process. And that's just to get to the stage of identifying candidate inhibitors. This is why it takes a decade or more to develop most drugs, or even to determine new applications for old drugs. It's a 10-20 year process that starts with the grad students in the lab just trying to get their experiments to work right. 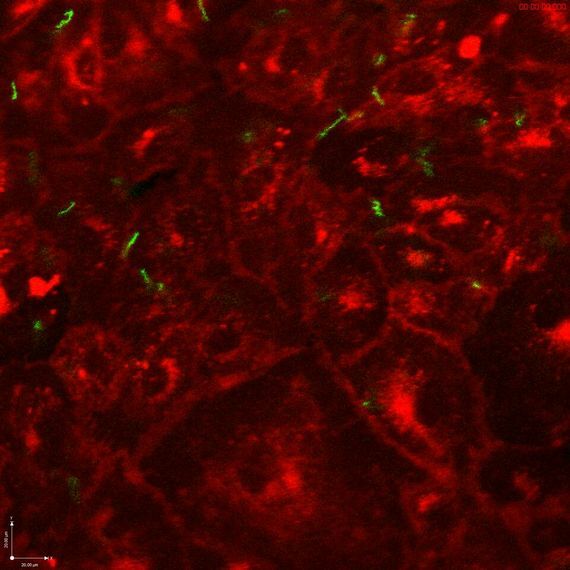 Borrelia burgdorferi bacteria (green) interacting with human endothelial tissue in a chamber that mimics human blood flow. Note that while most bacteria are swept up in the flow, some (note upper right and left) are able to stay in place through special bonds, allowing them to "crawl" along the walls of blood vessels on their own paths. This could have significant implications for understanding the behavior, and potentially treatment, of Lyme disease within the human body. Lyme disease is a contentious and in many ways controversial subject. Even the science, which most regular people would think would be cut and dry, is hotly debated. For example, emerging studies such as yours reveal previously unknown aspects of the bacterium that causes Lyme disease and which may affect progression of the disease. First, I came to the Borrelia research field from another field (telomere biology, which is important for cancer and aging). And I can tell you that even in this field, where a Nobel prize was awarded a few years ago, there were some pretty raging debates, and occasionally people's personal points of view could get in the way of civil behavior, and sometimes shut down other, valid points of view. Sometimes the more acrimoniously expressed points of view turned out to be right. Sometimes it was the people quietly pursuing other points of view who turned out to be right. The level of contentiousness in the debates didn't really accurately predict who turned out to be right and who turned out to be wrong. However, I actually think that strong debates, whether acrimonious or civil, are a sign that a topic is really important, and most crucially, that there's still a lot left to learn. People generally fight about how to solve things, but not so much after they've been solved, even if they don't particularly like the solution. And we disagree and struggle because we don't know enough yet, and because we're trying to define what the most important issues are to focus on. So debate and having opposing and controversial points of view are not a problem -- they're actually a sign of deep engagement with an issue, and this engagement can lead to progress in ways that apathy never does. I'm not particularly acrimonious by nature. I'm Canadian -- we are generally presupposed to be rather peaceful folk. I do really love a good civil, scientific fight based on facts (not name-calling -- I really liked that part of your profile on Huff Post). I really believe that good solutions to problems are often pragmatic and not perfect, are developed out of compromise and identifying the goals that everyone shares, and can be difficult to achieve in the middle of highly polarized debates, because polarization makes it harder for people to hear other perspectives, and drives decent, committed, intelligent people of good faith into camps which separate them from each other, or causes them to disengage from the debate and go about their work trying to ignore it. In other words, I think that trying to work through some controversial topics together would be far more helpful to advancing treatment of patients than different sides asserting that their version of the truth is more true than the others. Or maybe sidestepping some of the most controversial topics and focusing on the common ground would be most helpful if some of the controversy is so heated that it makes productive discussion on these topics impossible. Even as new discoveries are made, many people who call themselves advocates of "science-based medicine" claim that the science of Lyme disease is conclusive and that the scientific institution as a whole has reached consensus that there is no evidence of persisting Lyme disease infection. I actually don't think, based on my knowledge of the scientific field of Lyme disease research that most of us think that we have arrived at consensus about many topics. We're all still trying to find our way through the dark, so to speak. Good scientists have to be and do three things at once. We must be scrupulously open-minded, because we know from experience that most of our ideas turn out to be wrong when we actually try to test them, and that strongly held theories can bias the way we see our results. However, at the same times as keeping ourselves wide open to lots of different ideas, we must also be judicious. We learn to be judicious for the same reason that we learn to be open-minded: most of our ideas turn out not to be true when we test them rigorously, and we fail far more often than we succeed. So we learn to be careful about getting caught up in an idea that seems like a perfect explanation, because more often than not, we're just plain wrong. Finally, the way we achieve a balance between judiciousness and creative open-minded thought is by testing our ideas, and testing them as carefully and critically as we can, then waiting to see if other people arrive at a similar conclusion by testing these ideas independently. If we do not do this as scientists and as a scientific community, we are not fulfilling our professional and ethical responsibilities as scientists. To someone who is not a scientist, this insistence on evidence can be really hard to understand, and incredibly frustrating, especially when the stakes are high, such as when people are very ill. But if we don't strike this balance between creative open-mindedness and caution, we're not actually doing our jobs properly, and are not contributing constructively to the advancement of scientific knowledge and medical treatment. I actually think that there is much less debate about some of the issues related to Lyme disease than is commonly portrayed or assumed, and that most scientists are far more open-minded than perhaps is widely understood or depicted. I do think that we need to do a much better job at communicating the way we think about these issues, so that people understand the reasoning better, and understand why some topics such as evidence are so important to scientists. And I think that we're personally a little (or more than a little) afraid of being misconstrued, intentionally or unintentionally, mainly because being as accurate as we can be is so fundamentally and ethically important to most of us. So, in the spirit of trying to improve how we as scientists communicate, I've decided to try to explain a little bit of the personal make up of many of the good scientists I know, or at least of my own personal makeup, in the hopes that maybe this will help non-scientists understand a little bit about why we can be so frustratingly slow and cautious, and so wary of committing strongly and unreservedly to any particular theory. While it's objectively untrue that all scientists have reached any consensus, those who argue this usually do so based on the fact that evidence of persisting strains of the bacterium that causes Lyme disease, Borrelia burgdorferi, have been identified in vitro (in a petri dish outside of the human body) but not in vivo (within living human beings) in clinical studies. Your study used human endothelial cells "to recreate conditions inside blood vessels" in a laboratory setting. Do you believe that the conditions you created in a laboratory can be applied to what might or would happen inside of a human body? As far as the persistence debate goes, that is still wide open in the Lyme disease scientific community. I'm pretty agnostic about its implications, as I think many of us are, because we don't have enough evidence yet. I think the evidence for persistence is pretty compelling, but I don't think persistence necessarily equals disease. I think this debate hinges on what the criteria are for something to be considered infectious and disease-causing. There are lots of microbes that can persistently colonize a host without having any effect at all. This is causing a big shift in the way microbiologists think about infectious disease. Actually, I think that focusing on the microbe and whether it's there or not (or completely eradicating all remnants of it with antibiotics) may not actually be one of the most effective ways to approach the problem of Lyme disease in individuals who are not effectively treated by antibiotics. I think a much, much more important issue is probably identifying why some people get a hard-to-treat form of the disease when other people don't. This is where we may make some of the most important treatment advances...this and improving both the early sensitivity and accuracy of diagnostic tests. About the differences between laboratory strains and clinical strains. Laboratory strains actually are clinical strains -- they all came from patients at some point. I think the issue is probably the variety and range of strains that are studied in scientific studies. Scientific research is very labour-intensive and costly, so none of us can conduct all of our studies with a wide range of strains -- we'd never be able to complete our work if every experiment was done with multiple strains. What would you say to journalists, other researchers or policymakers who would discount your findings altogether because your study was conducted outside of human bodies? As for the question about whether our results are "valid" from a treatment point of view because they were conducted in vitro...we do know that what we're seeing shares a lot of similarities to what is seen in a living mouse with a fully functioning cardiovascular and immune system. Now, of course, one can easily argue that mice are not people, and that mouse models of Lyme disease do not adequately reproduce what happens in people. I couldn't agree more, and most scientists would say exactly the same thing. However, the trouble is that we have to try to make progress somehow, and we can't inject people with Borrelia to do experiments, so we have to try to use other methods too. Doing human-centred research using clinical samples is quite challenging. First, it's extremely expensive, because you need a lot of clinical staff involved, and they tend to be a lot better paid than graduate students in a lab such as mine (or any research lab supported by public funding, for that matter). Second, depending on the type of experiment/study you're doing with people, you can lose a lot of study participants over time, or may not have sufficiently similar control and experimental groups due to other factors. So, often clinical studies can be statistically underpowered -- that is, they don't have enough people, enough data or the right balance of people and data in different experimental groups to form statistically valid conclusions...and because there's so much variation between people, it's crucial that data are analyzed carefully using statistics, because there's so much potential for a random or unrelated difference to affect the interpretation of data. Medical research in all fields is absolutely littered with clinical studies that don't lead to definitive conclusions because of these problems, and these can lead to a lot of confusion about what is "right." Finally, one of the biggest problems in studies conducted with people is that they can often find that there's an association between two factors, but can't actually tell if this is because one factor causes the other factor, or if they're associated because they both happen to be the result of another unidentified factor. One of the best examples of this from epidemiology is the association between coffee drinking and pancreatic cancer. For a long time it was thought that drinking coffee was a risk factor for pancreatic cancer, a particularly lethal form of cancer. However, what the medical community finally realized was that pancreatic cancer had nothing to do with coffee drinking. The reason there was an association was actually because coffee drinkers also were much more likely to be smokers (back in the day when many many people couldn't have a cup of coffee without a cigarette). It took a long time to figure out that coffee drinking had nothing to do with pancreatic cancer, and that is was the cigarettes smoked with the coffee that were the culprit. So, what I, and I think almost every scientist would say is that we have to make progress where we can, but that we always need to push the boundaries of what we can do technically, to more closely mimic the processes we're trying to understand. We have to try to catch hold of one loose end in the big ball of knotted yarn and start slowly unravelling from that end until we get an idea we think is probably right. And then another lab has to test our idea in other ways, and we have to keep doing this ourselves. Individual Borrelia burgdorferi, shown in unique colors, interacting with the surface of endothelial cells, the cells that line blood vessels. Image credit: Rhodaba Ebady, Tara Moriarty. Published in Cell Reports. Image reused with permission. According to Scientific American, your coauthor Rhodaba Ebady suggested that "it is also likely that [the way by which your researchers discovered Lyme-causing bacteria move] helps the pathogens get to sites where they are able to evade the immune system and treatment." This statement is profound, as it implies that Borrelia burgdorferi can in fact evade both the immune system and antibiotic treatment within the human body -- that is, that the bacteria themselves may be able to persist despite natural and medical interventions. And yet the Infectious Diseases Society of America (IDSA) and its representatives and many science writers insist absolutely that either a) there is no evidence that Bb can persist within a human host following a short course of doxycycline or b) more absolutely that Bb has been proven not to be able to withstand a short course of doxycycline. In other words, these critics state that the science of Lyme disease is settled, and that the verdict is that while some patients may experience lingering symptoms following treatment, "the scientific consensus" is that all cases of Lyme disease are cured permanently with 21 days of antibiotic treatment. Those who advocate treating patients who experience persisting Lyme disease symptoms cite abundant evidence that in their opinion refutes such absolute claims. The International Lyme and Associated Diseases Society (ILADS), for example, has published a list of over 700 peer-reviewed scientific articles that describe and discuss Borrelia burgdorferi strains surviving after a typical course of antibiotics. The IDSA and other critics of ILADS consistently state that "suggesting that active infection is ongoing, is not supported by scientific evidence." Why in your opinion is there such a strong partisanship about the science of this particular pathogen, and where do you and your colleagues stand on the science? How can the arguably objective process of scientific investigation produce such a clean subjective divide: with scientists on one side claiming that science has proven conclusively that Lyme disease cannot persist in a human host following antibiotic treatment, and the other claiming that this has not yet been proved and warrants further investigation? One quick clarification...in Rhodaba's statement, she actually didn't say that this tactic helps the pathogens evade treatment. I actually contacted the journalist who wrote this article immediately after it came out to say that neither Rhodaba nor I remembered saying this, and did not intend to say that dissemination might affect treatment outcomes -- we absolutely want it to be clear that our study doesn't provide evidence about this in any way, and as scientists are worried when extrapolations are made from what we've said that we didn't intend to be made. The journalist said that since the word "likely" had been included, we didn't have to worry about misinterpretation of this sentence in her article, and it was not corrected since the article had already been posted. I do understand that journalists will tell a story differently than scientists, and that our goals are different, but this was something we actually wanted to be very careful about, because it would be misleading to say that this would affect treatment efficacy. It's possible, of course, but we need much much more evidence before we could responsibly conclude this. I do want to emphasize, though, that I actually don't think there's as strong a subjective divide between scientists and non-scientists as is often portrayed. I know a lot of scientists in the field, and we all talk and are a very disputatious and diverse group of people with a lot of different ideas. We're far from being a monolithic and highly coordinated group. I do think that many aspects of this issue are far less partisan than is assumed from outside the scientific field. And again, I think that part of this issue is that scientists have to start communicating more and better about what we do, because it's obscure and opaque to non-experts, and because we spend a lot of time worrying about being misconstrued. Finally, I think one of the biggest obstacles right now to making progress is this sense that there is a real polarization. Perhaps if we can reframe some of this issue in a way that doesn't depend on seeing two "camps," it would make it easier to identify the goals which everyone agrees about (I think that improving the sensitivity and accuracy of early diagnostics is one goal which everyone supports). I know that many scientists feel the same way, and think that perhaps identifying the moderate majority in all groups who could carry discussion forward in a pragmatic way might be an effective way to really make progress. The above interview was slightly abridged for brevity. In the third and final installment of my conversation with Moriarty, we will discuss the state of biomedical research today, including the need for greater investment in Lyme disease research and what research Moriarty and her team, as well as other scientists, need to do next to continue to make advancements in understanding Lyme disease.